Upon entering Hustler’s manufacturing facility, the company’s strength is unmistakable. New models are in production, boats are in molds waiting to be pulled, older models are being refurbished and a variety of new boats are awaiting delivery. Owner of Hustler Powerboats, Joe LoGiudice, along with vice-president of marketing and sales, Paul LoGiudice, are forging ahead and not looking back. Companies such as Outerlimits, Sunsation and Laveycraft, to name just a few, have built smaller single-engine V-bottoms to meet the demand of a more affordable style of sport boating – without losing the “wow” factor. Hustler reacted to this new market with the debut of the 29 Rockit. Joe and his team set out to build the finest boat in its class, and it shows. Starting out on a clean slate, Hustler designed this newcomer from the bottom up. The hull has two steps, one amidships on the center of gravity and the other located just forward of the engine compartment bulkhead. In addition to the main steps, there are a set of step-lets (or mini-steps) incorporated in between both running surfaces. The theory behind this is to reduce surface adhesion and increase speeds without a loss of handling. This is not a sit down gunshot. The 29 is 29 feet with many amenities that are found in her larger sistership, the 39 Rockit. 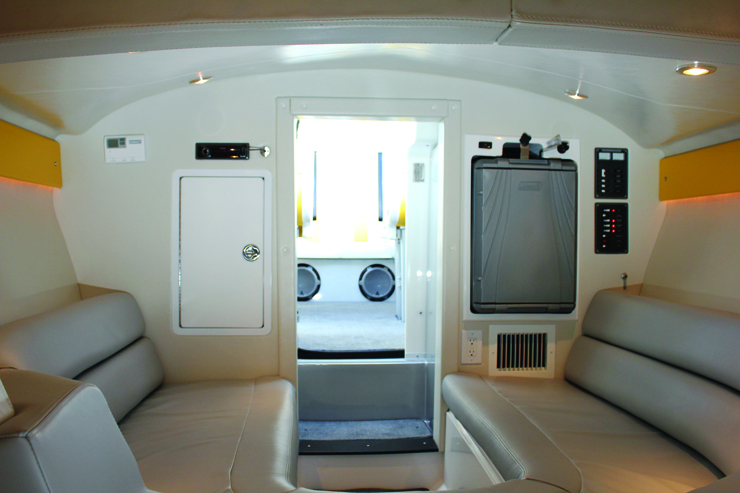 The cockpit has dedicated seating for six passengers with the option of sitting down or standing up. The dash in our test boat was impressive. 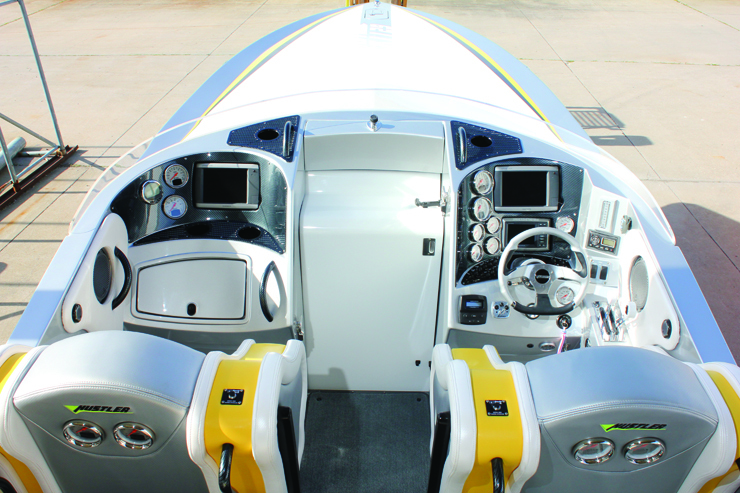 Placement of every gauge, screen, switch, shift throttle controls, GPS and drink holders have been thoughtfully placed and our test boat was outfitted with two Interfaced Garmin 5208’s that display three-dimensional charts revealing the engine vitals on either side of the cockpit dash boards. Mercury’s SmartCraft VesselView is neatly mounted in the dash and in plain sight. The carbon fiber panels have also been custom designed to angle every component so it’s correct to the operator’s line of sight. When I opened the cabin door I immediately noticed that the old track-style mechanism has been replaced by a redesigned system that opens and closes and locks into place smoothly and quietly. Forward is a spacious cabin and V-berth that will actually sleep two full-size adults. At the request of Hustler’s client, this 29 was spec’d out with AC, 12-volt outlets and an over-the-top stereo. Despite the long list, I haven’t even scratched the surface of the countless, innovative options and amenities that can be available with the 29. We loaded the boats in the water in Jamesport, NY, and headed out into Peconic Bay, located between the north and south fork of Eastern Long Island. The Mercury 700 SCi equipped with NXT drives starts and idles without any effort. Running alongside us, in the photo boat, was Joe in a Hustler 39 Rockit, freshly equipped with twin Mercury Racing 1100 hp engines. As we idled out onto the Peconic I couldn’t help notice how large the 29 felt and looked. The butterflies in my stomach came from both the anticipation of driving a new Hustler, and having Joe riding alongside me in a 39 Rocket. I eased the throttles forward with no tabs and the drive tucked negative. The 29 was on plane in less than four seconds – I trimmed the boat neutral and immediately noticed that the windscreen was not forcing the airflow into my eyes. At 3,300 rpm, we were cruising at 46.5 mph with neutral drive and tab position. I brought the boat to 4,000 rpm and felt the 29 become very happy at 62 mph. At this speed I started to do some tight slalom turns with complete predictability. I then brought it up to wide-open-throttle, which is approximately 5,300 rpm, and the GPS read 93 mph with neutral trim on the drives. I gave it some positive trim with no noticeable gain in speed (just rpm). I made some hard runs at the photo boat 80 plus mph and rolling into a full race-style turns. The 29 shows no signs of sliding or breaking loose. It did everything I asked of her and more. The smiles on my face told the story. I only wish that I could have made a run out to Shinnecock Inlet and find some real rough water. Hustler builds one of the finest in the performance boat market – from the state-of-the-art construction materials to vacuum bagging with high tech fabrics such as Kevlar/carbon fiber and Vinylester resins in the hull construction. The rigging and wiring go unnoticed and lift up any hatch or access compartment and you will see why Hustler powerboats are built one at a time.